Jackpot Mobile Casino will then reward you with a bonus (Welcome Bonus is for new players only). The terms and conditions of the bonuses vary between different casinos and might also change over time and between different countries, so it is important to compare the different offers and read the T&C for Jackpot Mobile Casino before signing up. 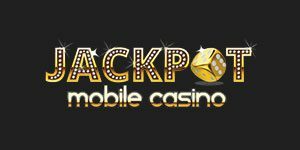 Jackpot Mobile is a Nektan powered, instant play casino developed primarily for mobile device users located in UK, Ireland, Norway, Sweden, Germany, Canada, Australia and New Zealand. As a part of ProgressPlay Limited casinos, Jackpot Mobile is licensed by Gibraltar Regulatory Authority and UK Gambling Commission, offering a variety of games tested for fairness and carrying UK RNG Test Certificate as well as Malta and Gibraltar RNG Test Certificates. Every few months, the casino will also provide a payout percentage report for all of their gaming categories (slots and table games), and their average RTP usually falls in between 95 to over 97%. 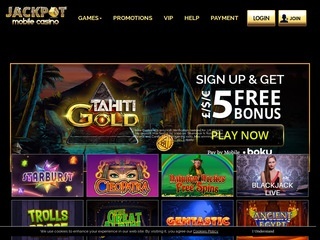 The site is available in multiple languages and is very well organised – finding your way is quite easy, as is the registration process; in only a few simple steps, your account will be activated and you will be ready to unlock one of the casino’s welcome bonuses or take advantage of their weekly promotions for account holders. The majority of games found on Jackpot Mobile is provided by Nektan, popular software provider featured by a number of UK online casinos. Nektan is not the only provider Jackpot Mobile cooperates with and one can also find games released by Microgaming, NetEnt and NextGen, which can be filtered by the slot name or according to different categories used by the casino to organise the offer: New, Favourites, Live etc… Most of the games, excluding some of the slots and all the games under the Live Dealer category, will be available in demo play, even if you do not have an active account or if you are located in one of the restricted countries. If you know what you want, you can find any game (as long as it is available on the Jackpot mobile) using a search bar. Slots are mostly divided according to their popularity with the players, payouts and date of release. Progressive slots are placed under Jackpots, where one can find over a dozen slots with a continuously increasing potential payouts, such as Mega Moolah, Wolf Run, Viking of Fortune, Siberian Storm and others. The details on the current Jackpot are available on the slot image preview and this is one of the categories that does not allow fun or demo play. The Table games offer is pretty conventional and Casino Games category combines both Video and Live Dealer tables. There are several Blackjack variants, each with different table limits and side bets, Roulette and virtual Poker tables, all provided in demo and cash play. Some of the games that are usually placed under this category are stored under Instant Win in Jackpot Mobile Casino, and the category is shared by Lotto, Bingo and some Instant Win slots. Scratch Card games cam be located under Jackpots. Live games are streamed from Evolution studios and the entire offer is provided solely by this developer. There is something for every type of player, from standard and high limit Blackjack, Baccarat, Poker and Roulette tables, to Blackjack Party and Dream Catcher. Players choose their preferred payment method during the registration process and Jackpot Mobile Casino accepts PayPal, VISA, VISA Electron, Maestro, MasterCard, Boku, Neteller, Paysafecard, Skrill, Trustly and Zimpler. The minimum amount that one can deposit is £10, except for Boku users, who will need to deposit at least £15 or a maximum of £30, with a 15% fee. The minimum withdrawal amount is set at £20 while the maximum is capped at £2,000. Once the player requests for the money to be withdrawn, the casino will start the verification and approval procedure which can take up to 3 business days, during which the players may be asked to provide additional documents, especially if higher amounts are in stake. After the approval, the money will settle in approximately 24 hours on e-wallet account or in 3 to 5 working days if you are withdrawing it to your payment card linked account. To get support, players can use email, phone or Live Chat option. The best thing about Jackpot Mobile is that you do not even have to be the casino account holder in order to get assistance and start a chat session with one of their customer representatives. Email is one option that you can use during the day, while Live Chat and phone support are available from 8.00 to 00.00 GMT/BST time. In most case, you may even discover that there is no need to reach out to the casino and ask to speak to the representative, as pretty much all you need to know is covered under FAQ section. If, however, you still prefer to speak to an actual human, you will be pleased with the level of efficiency, extremely short response time and the professional way the agents are handling themselves.